I have this gorgeous red lipstick that I adore…but…it smears everywhere. I’ve tried to be very careful when I put it on, but no matter what I do, it just inevitable smears. Then when I try to clean it up, I have another mess to fix because I wind up wiping off some of my makeup to clean up my lipstick mess. Do you have that problem? Sadly, we all do. It would actually be my favorite lipstick if it would just be easier to put on and stay where I want it. You know, on my lips and not all around my lips the second I take a drink, kiss my hubby, or rub my lips together, or accidentally touch my lips. Do you know what I mean? Of course, you do! Because there’s always that one lipstick! This particular lipstick that I’m wanting to fall in love with is L’Oreal’s Colour Riche in Blake’s Red #402. It’s Blake Lively’s matte red lipstick and I love the color. I bought it about two years ago and I hardly wear it because it can be so difficult to put on. But it’s such a pretty red! I am fair skinned with freckles and this red makes me feel so pretty and it pops but doesn’t overpower my skin tone as some reds can. It’s like the perfect French girl red. Anyway, it’s very matte and dry and can be difficult to apply and every time I’ve worn it, it just smears and makes a mess. But isn’t it the prettiest shade of red? Sunday I was determined to make it work. I had decided to wear a French-inspired outfit to church, black jeans, black and white striped shirt, a mid-length beige cardigan and black ballet flats. So it was the perfect day for red lips, but since I was working in children’s church and had a meeting after service, the last thing I wanted to do was worry about whether my lipstick was smeared all over my face. I also have a habit of rubbing my lips together which makes matters worse. So, I remembered a trick from years past. There is nothing new about this trick, it’s been around forever, but sometimes we just need a reminder! Here are the steps I used to keep my lipstick on all day and in its place. First off, make sure you start with a great foundation for your lipstick. Exfoliate your lips and moisturize them. That base will make your lipstick smoother and less likely to feather. If you don’t have a lip exfoliator, rub your toothbrush over your lips. It works! Next, line your lips in a shade that closely matches your lipstick. I used Essence Longlasting Lipliner in 01 Ready for Red. Don’t stop with just the line, fill your lips in completely with the liner. Put on your lipstick. The nice thing about the Essence liner is that it really helped to grab the lipstick as I put it on. 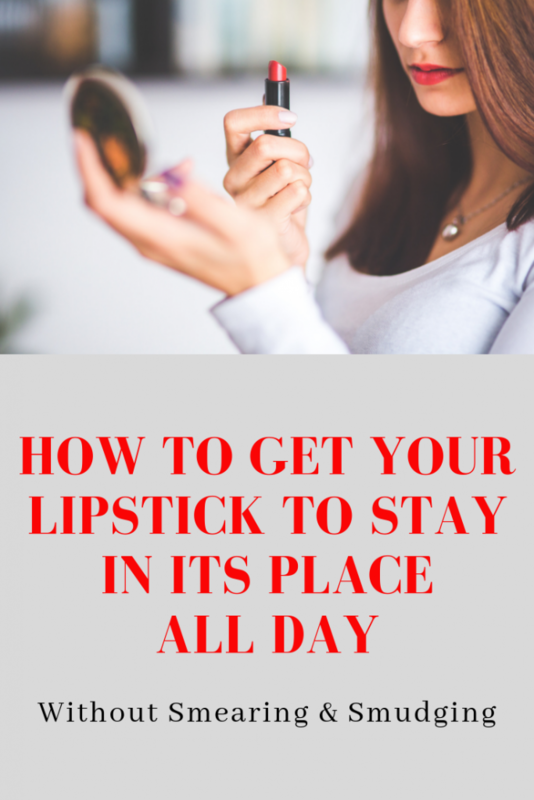 Don’t forget that sometimes using a lipstick brush is better than just normally smearing the lipstick on, especially for tricky lipsticks. Then take a powder puff with a little setting powder (I use L.A. Girls Pro Powder HD in translucent) and gently apply to your lips. Yes, it feels really dry at first, but it helps if you only use a small amount of powder, but it will not feel as dry later. Also, make sure to use a true translucent powder and not a colored powder which may change the color of the lipstick). Voila! Lipstick on and in its place. It really did stay on all day. When I went to bed, there was still a remnant of it on. It took makeup remover to get all of it off. It was great! I hugged friends, hugged some little ones, ate lunch and made it through a meeting. It was awesome! All thanks to a little trick and having some great products help it stay put. I can’t wait to start wearing this all the time!